Home Free Radicals and Antioxidants, Vol 8, Issue 2, Jul-Dec 2018 Antioxidant Capacity of Some Selected Medicinal Plants in East Nusa Tenggara, Indonesia: The Potential of Sterculia quadrifida R.Br. 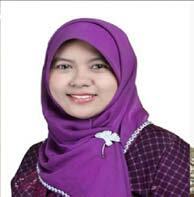 Kristoferson Lulan, Fatmawati, Santoso, and Ersam: Antioxidant Capacity of Some Selected Medicinal Plants in East Nusa Tenggara, Indonesia: The Potential of Sterculia quadrifida R.Br. Department of Chemistry, Faculty of Mathematics and Natural Sciences, Institut Teknologi Sepuluh Nopember, Sukolilo, Surabaya, East Java, 60111, INDONESIA. Department of Chemistry, Faculty of Science and Engineering, Universitas Nusa Cendana, Penfui, Kupang, East Nusa Tenggara, 85001, INDONESIA. Medicinal plants derived natural product such as alkaloids, flavonoids and terpenes. The traditional uses claim that medicinal plants of NTT are potential folk medicine but very little research has been conducted on these plants. The present study is directed towards evaluating naturally effective antioxidant of twenty-four traditional medicinal plants collected from Kupang, East Nusa Tenggara (NTT) using in vitro models. The antioxidant activities were determined by using the free radical scavenging assays 1,1-diphenyl-2-picrylhydrazyl (DPPH) and 2-2”-azino-bis(3-ethylbenzothiazoline-6-sulfonic acid) (ABTS). Analysis of total flavonoid and phenolic contents were expressed as Quercetin Equivalent (QE) and Gallic Acid Equivalent (GAE), respectively. Statistical methods are used in data analysis include mean or standard deviation, and regression analysis. Methanol extract of Sterculia quadrifida R. Br. root exhibited the highest DPPH radical scavenging activity with IC50 value of 3.11μg/mL, followed by Schleichera oleosa and Euphorbia hirta L. extracts with IC50 values of 10.05 and 10.09 μg/mL, respectively. Methanol extract of S. quadrifida also showed highest ABTS radical scavenging activity with IC50 value of 7.29 μg/mL, followed by Eugenia jambolana Lam. and Lamea grandus with IC50 value of 9.15 and 12.29 μg/mL, respectively. S. quadrifida extract showed high flavonoid and phenolic content with 661.85 mg of GAE and 116.84 mg of QE per 100 g of extracts. The present study gives scientific evidences that twenty four samples of NTT plants have high free radical scavenging capacity. Strong radical scavenging activity of these plants especially S. quadrifida could be considered as a potential source of natural antioxidants. This study focus on in vitro antioxidant activity of twenty-four traditional medicinal plants, in order to explore the potential of medicinal plants of NTT. The present study is directed towards discovering naturally effective antioxidant of plant origin from NTT. The traditional uses claim that medicinal plants of NTT are potential folk medicine but very little research has been conducted on these plants. The evaluation of twenty-four traditional medicinal plants endemic from NTT had been performed. The most active as antioxidant is Sterculia quadrifida R. Br. S. quadrifida is the most plant used in NTT traditional medicines. Traditionally, bark and roots extracts of S. quadrifida are commonly used to treat various diseases such as diabetic, liver and cancer. S. quadrifida locally known as Faloak is an endemic plant to NTT as shown in Figure 1. It grows wild throughout NTT including Timor, Sumba, Flores and Alor islands.22 To the best of our knowledge, this is the first report on the antioxidant potency of crude extract from NTT traditional medicines including S. quadrifida. The aim of this research is to find out total flavonoid content (TFC), total phenolic content (TPC), and in vitro antioxidant activity of extracted medicinal plants from NTT by using free radical scavenging assays DPPH and ABTS, in order to explore the potential of medicinal plants of NTT. This research would give scientific knowledge on NTT medicinal plants which are potentially used as antioxidant for further development of antioxidant. 1,1-diphenyl-2-picrylhydrazyl (DPPH), 2-2”-azino-bis(3-ethylbenzothiazoline-6-sulfonic acid) (ABTS), trolox, quercetin, gallic acid and dimethyl sulfoxide (DMSO) were purchased from sigma chemical company (St. Louis, MO-USA), Folin-Ciocalteu reagent, Na2CO3, NaNO2, AlCl3.6H2O, NaOH, ethanol 99.5 % and methanol were acquired from Merck (Darmstadt, Germany). Other chemicals used for the study were analytical grade. Plants were collected from some areas around Kupang district, NTT province, Indonesia. The samples used were leaves, roots, and barks of the medicinal plants were shown in Table 1. Voucher specimens were identified at Purwodadi Botanical Garden, East Java. Specimens of the collected plants were deposited in the laboratory of Natural Product Chemistry and Synthesis, department of Chemistry, Institut Teknologi Sepuluh Nopember, Surabaya. Traditional uses of medicinal plants from East Nusa Tenggara (NTT). The plant sample was air-dried to eliminate the humidity. Then, it was pounded into a fine powder. Next, it was weighed for 100 g and was extracted by maceration with 400 mL methanol in 24 h at room temperature. Then the extract was filtered and evaporated under vacuum by using rotary evaporator to dryness. The molecule formula of DPPH is C18H12N5O6 with molecular weight 394.32 g/mol. DPPH dissolvent is 6 x 10-5M made by dissolving 0.24 mg of DPPH in 10 mL methanol. DPPH assay was determined by the method of Brand Williams modified by Dudonn’e et al.23-24 About 3 mL of 6 x 10-5 M DPPH solution was mixed with 100 µL samples in a test tube. After being incubated for 20 min at 37°C of temperature, absorbance decrease of the mixture was determined at 515 nm in a UV-Visible Spectrophotometer (As). Radicals DPPH have maximum absorbance at about 515 nm (Ab). The absorbance of blank of DPPH solution was also measured at the same wavelength (Ab). Trolox was used as positive control. The experiment was performed in triplicate. Radical scavenging activity was calculated by using the following way. ABTS radical scavenging assay were described by Re et al.25 About 5 mL of 7 mM ABTS ammonium aqueous solution was mixed with 88 µL of potassium peroxydisulfate (K2S2O6) 140 mM. The mixture was allowed to stand for 12-16 h at room temperature to yield a dark blue solution. Then it was mixed with 99.5 % of ethanol which gave 0.7 ± 0.02 units absorbance at 734 nm to get working solution. One mL of working solution was mixed with 10 µL of samples extract and shuffled for 10 sec, then incubated at 30°C of temperature for 4 min. Then, the absorbance of the mixture reaction was measured at 734 nm to produce As values. Ethanol 99.5% was used as a blank solution and its absorbance was measured to produce Ab value. Trolox was used as positive control. 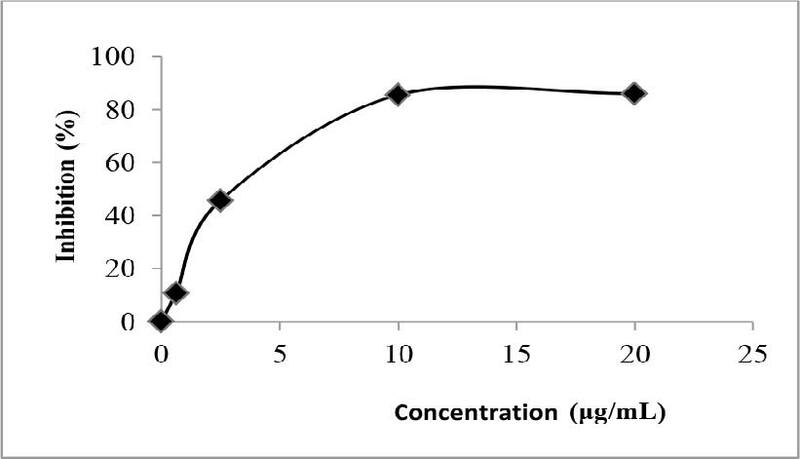 The inhibition rate was measured by the same formula as shown in DPPH assay. The TFC was determined using the Aluminum chloride colorimetric assay described by Zhishen et al. (1999)26 with some minor modifications. The extract was dissolved in methanol at a concentration of 100 μg/mL and distilled water was added to make 5 mL. A 0.3 mL 5% NaNO2 was added to the flask. After standing for 5 min at room temperature, 0.3 mL 10% AlCl3.6H2O was added to the flask and was allowed to stand for 6 min at room temperature. 2 mL 1 M NaOH was then added and the total volume was made up to 10 mL with distilled water. After a thorough mixing, the absorbance reading was recorded at 510 nm using a UV-visible spectrophotometer. Results were expressed as mg quercetin equivalents (QE)/100g of extract. All samples were analyzed in triplicate. The TPC was determined using the Folin-Ciocalteu (FC reagent) assay following Singh et al. (2013).27 The extract was dissolved in methanol at a concentration of 100 μg/mL. Then, these sample solutions were mixed with 3.6 mL of water and 0.4 mL of FC reagent 10% (v/v) and were allowed to stand for 5 min at room temperature. 4 mL 7% Na2CO3 solution was then added. The solutions were made up to 10 mL with water mixed. After 90 min, the absorbance of each samples was recorded at 760 nm using a UV-visible spectrophotometer. Results were expressed as mg gallic acid equivalents (GAE)/100g of extract. All samples were analyzed in triplicate. Antioxidant activity of traditional medicinal plants from NTT has been determined by using two measuring methods, DPPH and ABTS free radical scavenging assays. All the medicinal plants showed varying free radical scavenging activities as potent antioxidant when compared to trolox as a standard. There was a wide range of antioxidant capacities of medicinal plant extracts using DPPH assay. The DPPH inhibition rate varied from 0.8 to 90.06 %. The reduction capacity of DPPH radical shown by absorbance decrease at 515 nm induced by antioxidants. S. quadrifida was reported as a strong potential antioxidant plant with 80.13 % of radical scavenging capacity. Other antioxidant compound resource exists in Euphorbia hirta L. and Lamea grandu with 90.06 and 89.92 % of DPPH inhibition rate successfully. Trolox was taken as standard showed 97.89 % antioxidant activity. Whereas Solanum tarvum, Euphorbia tirucalli L. and Alstonia scholaris L.R. Br showed low level of antioxidant capacity with 0.80; 3.79 and 6.85 % of DPPH inhibition rate respectively from selected plants. The result of DPPH radical scavenging at 319.45 ppm of medicinal plant extracts is shown in Figure 2. Free radical scavenging activity of 24 NTT medicinal plant extracts at a concentration of 319.45 μg/mL for DPPH and 99 μg/mL for ABTS; triplicate experiments. To confirm the antioxidant activities using DPPH radicals, we examined the IC50 values of six plant samples which had the highest activity in the screening result (Table 2). Antioxidant activity of potent NTT traditional medicinal plants using DPPH assay. The experimental results showed the highest antioxidant activity by DPPH method was observed in S. quadrifida plant extract with IC50 value of 3.11 µg/mL. The low IC50 value indicate high antioxidant activity of the substrate. 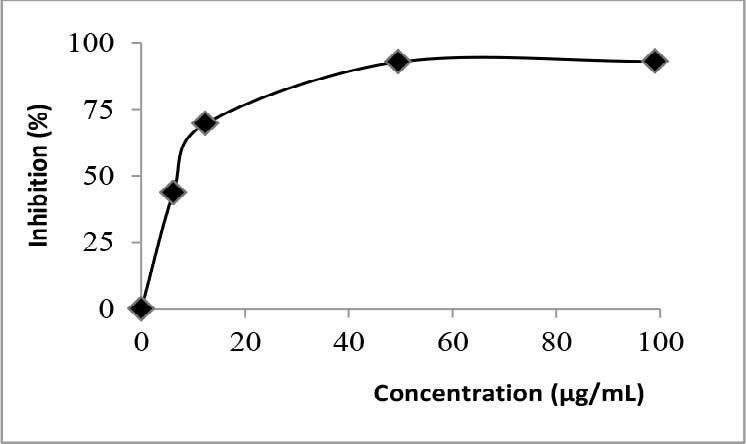 Figure 3 shows inhibition rate of S. quadrifida using DPPH radical scavenging assay. DPPH radical scavenging activity of Sterculia quadrifida R. Br. The free radical scavenging has also determined using the ABTS scavenging assay. ABTS radical scavenging activities of medicinal plants varied from 2.78 to 99.66 %. The reduction of radical ABTS is shown by the decreasing of absorbance at 734 nm. 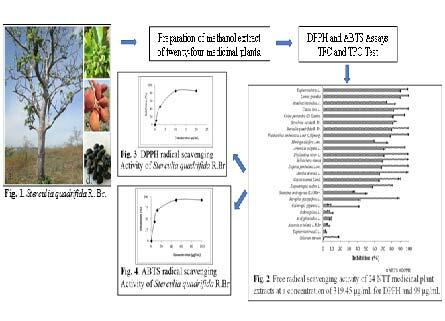 The highest antioxidant capacity was observed in extract of S. quadrifida with 99.66 % of ABTS inhibition rate, followed by Cassia tora L. and E. jambolana with 99.49 and 99.42 % respectively. Whereas E. tirucalli, A. scholaris, and Bidens pilosa L. showed low antioxidant capacities values of 2.78; 4.69 and 6.50 % of inhibition rate successfully. Trolox was taken as standard showed 95.97 % antioxidant activity. The result of ABTS radical scavenging at 99 ppm of medicinal plant extracts is shown in Figure 2. Table 3 showed the IC50 value of NTT traditional medicinal plants from ABTS assay. 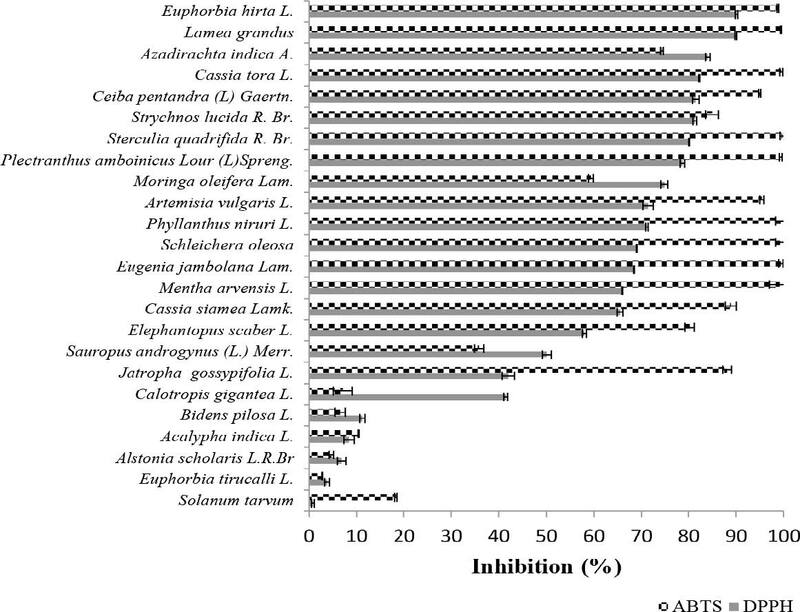 Antioxidant activity of potent NTT traditional medicinal plants using ABTS assay. In this study, the highest antioxidant activity by using ABTS is found in S. quadrifida with IC50 value of 7.29 µg/mL. The extracts of E. jambolana also have strong antioxidant capacity with IC50 values of 9.15 µg/mL followed by L. grandus with IC50 values of 12.29 µg/mL. ABTS radical scavenging activity of S. quadrifida is shown in Figure 4. ABTS radical scavenging activity of Sterculia quadrifida R. Br. An extensive range of flavonoid and phenolic content were estimated in medicinal plant extracts. The highest total flavonoid content was observed in extract of S. quadrifida with 661.85 mg of quercetin equivalents (QE) per 100 g of extracts, followed by S. oleosa with 595.19 mg of QE per 100 g of extract. Quercetin is used as a standard for flavonoid content. S. quadrifida also showed a high total phenolic with 116.84 mg of gallic acid equivalents (GAE) per 100 g of extract as shown in Table 4. Gallic acid is used as a standard for phenolic content. In TPC test, it is considered that a complex is formed between extract and reagent indicated by colour changes from yellow to blue. Total flavonoid and phenolic content of potent NTT traditional medicinal plants. The phenolic and flavonoid content in plant extracts impacts significantly to their antioxidant potential which might be responsible for radical scavenging activity. 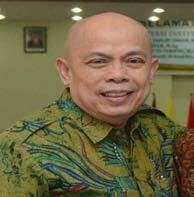 Various study revealed that phenolic and flavonoid are the most important substance that present numerous biological activity and pharmacology properties.31 The results of this study support that medicinal plants in NTT is rich in phenolic and flavonoids that might contribute to potential antioxidant activities. The secondary metabolites found in one species in a genus will be similar to another species in the same genus. Flavonoid, terpenoid, alkaloid, phenolic and steroid were reported to exist in other species of genus Sterculia, but there is no literature reports found on the chemistry of S. quadrifida. It offers a challenge in finding new constituent from S. quadrifida. Study of genus Sterculia plant extracts revealed some biological activity like anti-diabetic from S. villosa,5 anti-inflammatory and antifertility activity from S. foetida,33 larvacidal activity from S. guttata,34 and anti-proliferative activity from S. tavia.35 Some chemical constituents also reported from genus Sterculia plants such as sitosterol and betulinic acid were isolate from S. striata,36 sterculinine I and II were isolate from S. lychnophora,37 and 1,6-diferuloyl glucose was isolate from S. foetida.38 Although the genus Sterculia has been well investigated, S. quadrifida has not been explored for its chemical constituents and biological activity. Further investigation on isolation and identification of bioactive constituents derived from S. quadrifida is in progress. The present study gives scientific evidences that twenty four samples of NTT plants have high free radical scavenging capacity. S. quadrifida is a promising candidate for antioxidant investigation for future studies. Methanol extract of S. quadrifida root exhibited the highest DPPH and ABTS radical scavenging activity with IC50 value of 3.11 and 7.29 μg/mL, respectively. S. quadrifida extract also showed high flavonoid and phenolic content with 661.85 mg of GAE and 116.84 mg of QE per 100 g of extracts. The result is a valuable reference of antioxidant properties from NTT traditional medicinal plants, which is serve as scientific value of antioxidant source in Indonesia. The Authors would like to acknowledge to The Indonesian Directorate General of Higher Education (DIKTI) for Research Grant and Beasiswa Pendidikan Pascasarjana Dalam Negeri (BPPDN) Scholarship for financial support of TYKL. We also thank to Purwodadi Botanical Garden staffs for plant identification and deposition, Ms. Fitria, Ms. Mutia DH, and Ms. Wiwit DF for kindly sharing information of related experimental details. Twenty-four traditional medicinal plants collected from Kupang, East Nusa Tenggara (NTT) were determined for antioxidant activity by using the free radical scavenging assays DPPH and ABTS. The present study revealed that the methanol extract of Sterculia quadrifida R. Br. root exhibited the highest DPPH and ABTS radical scavenging activity. It also showed high flavonoid and phenolic content. Strong radical scavenging activity of these plants especially S. quadrifida could be considered as a potential source of natural antioxidants. 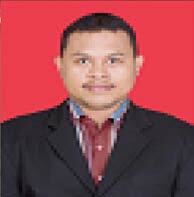 Prof. Dr. Taslim Ersam: Lecturer at Department of Chemistry, Faculty of Mathematics and Natural Sciences, Institut Teknologi Sepuluh Nopember, Sukolilo, Surabaya, East Java, 60111, INDONESIA. 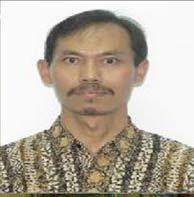 Prof. Mardi Santoso, Ph.D: Lecturer at Department of Chemistry, Faculty of Mathematics and Natural Sciences, Institut Teknologi Sepuluh Nopember, Sukolilo, Surabaya, East Java, 60111, INDONESIA. 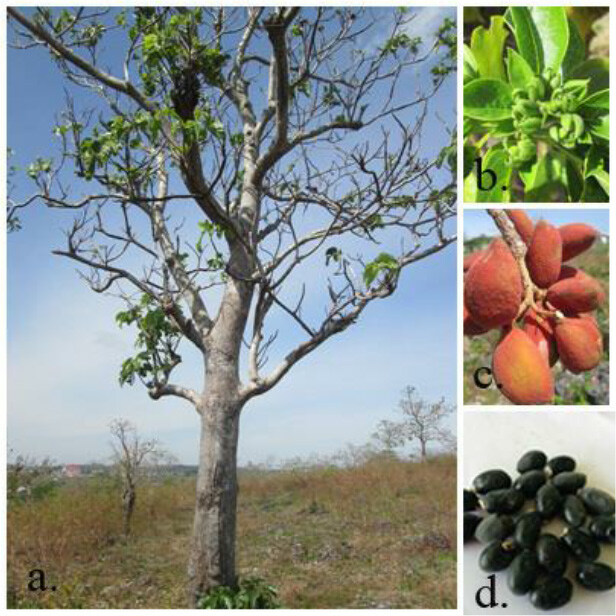 Cite this article: Lulan TYK, Fatmawati S, Santoso M, Ersam T. Antioxidant Capacity of Some Selected Medicinal Plants in East Nusa Tenggara, Indonesia: The Potential of Sterculia quadrifida R.Br.. Free Radicals and Antioxidants. 2018;8(2):96-101.